I can hear gusts of wind outside - but we're snug and safe and warm inside. What an exciting time...the work continues - details. All making the place even better. After a couple of love, quiet, days today was a madhouse, starting at 8am. So many people - from Rose doing some last minute cleaning to Mike doing some minor repairs, to Terry the electrician and Lise and Del putting up christmas decorations outside - Bob arrived to supervise. 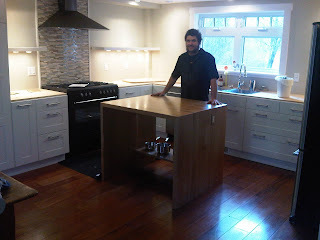 But the big thing that Cameron arrived with the kitchen island and shelves. There's a photo of him when it was just installed. 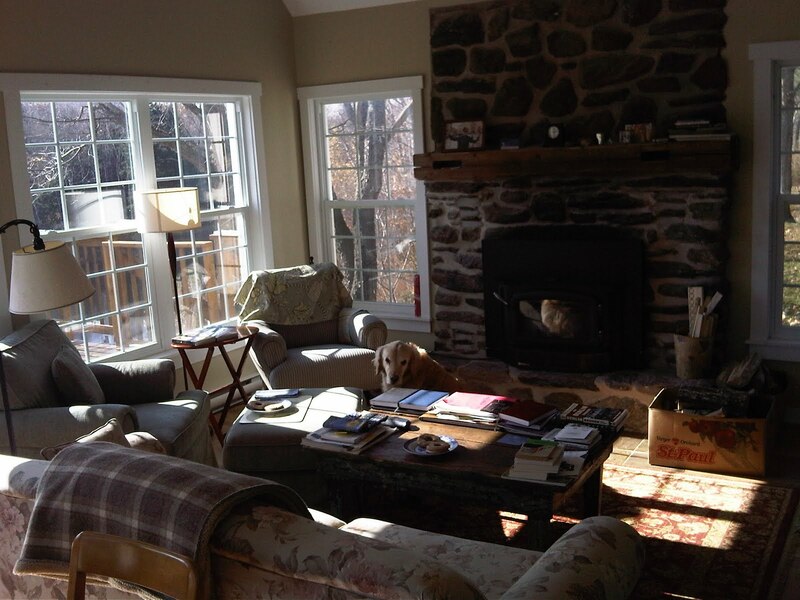 the other photo is the view from roughly where Cameron was standing (a little blurred) The last picture is taken from my chair by the fireplace., aftereveryone left - at 3:30 this afternoon. Still more to do....marble countertops to go in. Vermont Marble doing it....but they just called to say that the slab they were working on for us had a vein in it, and it cracked....so back to the quarry. Oh well. 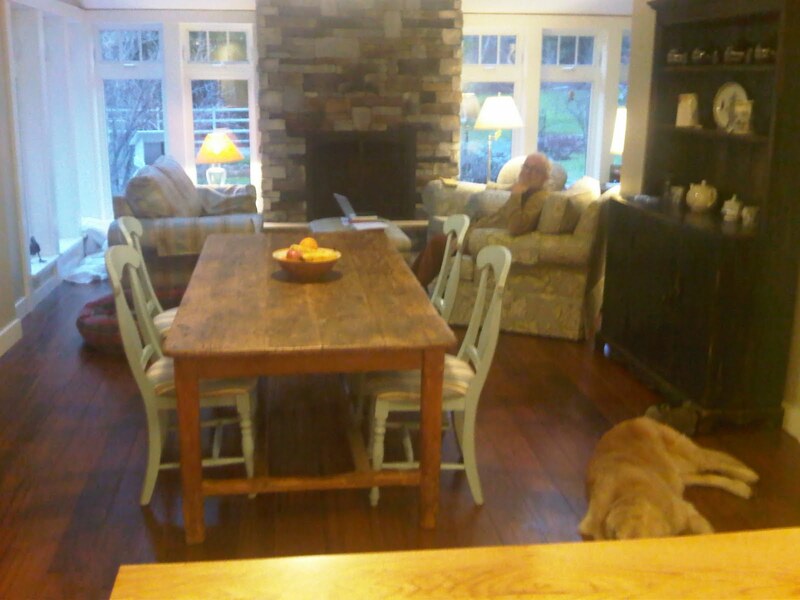 We have an area rug that Kirk and jane helped choose and have ordered arriving for under the kitchen table (in the middle of the room). Cameron is also making us a bookcase for the cookbooks in the pantry. But - for the most part - it's done!!! We can barely dare to believe it. A few small things happening tomorrow - then off to New York City on Thursday for the Nero Awards banquet. That's happening Saturday night. Bury Your Dead is nominated! Very exciting. the geo-thermal fellows just arrived. Seems quite a large piece of the ducting was left off the machine in the basement.... at least, that's my understanding. And with winter coming on, we don't need that. Thank God it has been so mild! How are you doing? It has been such fun to report from the frontlines of both my writing life and personal life - the renovations. Thank you for being interested. I appreciate it! A wonderful, mild, day. Ended up getting quite a bit of snow yesterday too - but it's all gone now. Beautiful day. We set the alarm for 6am - and out of the house by 7:30 - over to the main house. Lise was already there - Deanna, Donna and Rose arrived a few minutes before 8. And the Big Cleanup began. Very impressive to see four women who hate dirt and disorder get rid of both. I was almost in tears. While they did all the filthy work inside I decided to take advantage of the unusually mild day and clean the new windows outside. first, scrape with a razor the flecks of paint...then windex. All on top of a step ladder. I wondered if I'd feel uncomfortable, but it just wasn't all that high. It was actually quite fun - except for the torrential melt streaming off the roof and onto my head. I'd put on a raincoat and a hat, but of course it came down right on top of me. Sunny everywhere else on the property, except where I needed to stand. Felt a bit like a keystone cop. but what a difference it makes to the windows. Feels wonderful. I've come back to the cottage briefly to pack more things and get some lunch - and now will hop on back. The other people who came today was an Ikea guy who needed to fix something....and Mike. All the above was written two days ago...interrupted by the ringing of.the phone. 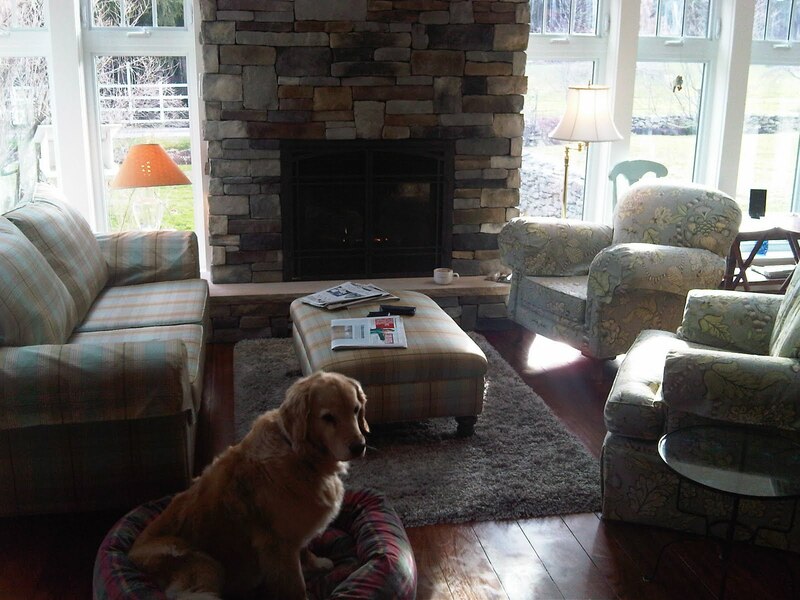 It was Lise at the main house saying two fellows had just shown up with a truckload of furniture. I stopped in mid-sentence and flew out of the cottage. It was all the furniture we'd had re=upholstered....it had arrived!!! We'd been waiting three months for this moment, wondering what the 'new' old furniture would look like in our 'new' old home. How many times Michael and I discussed placement - and asked Kirk his opinion. To be honest, i couldn't even remember what fabric we'd chosen! So long ago and so many decisions. Sure enough, when we got back to the main house the furniture was being unloaded - into the chaos....but they managed....and unwrapped and placed it. 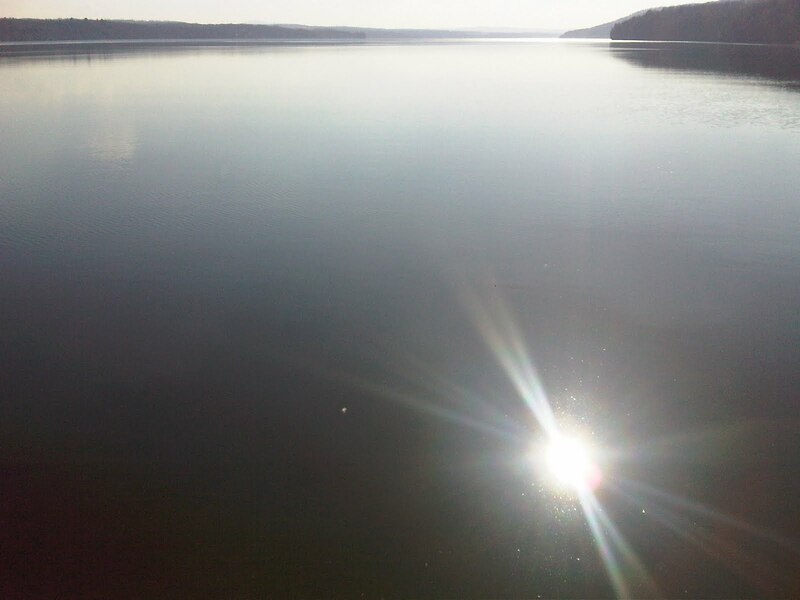 Wow - you can see the photo, taken today...even better than I dared dream. Oh, it gives me such pleasure, and at the same time a lovely, settled feeling of peace. By five o'clock Friday evening everyone had left and Michael and I dropped into the chairs on either side of the fireplace, poured a diet ginger, got out some fruit cake - and sighed. Dear Lord, we made it. As you can see, the kitchen isn't quite finished - but close enough so that we can live here and cook. Saturday at 8am, Darol, who was putting on the wallpaper, arrived to finish the job. Then Ikea arrived with the new sofa that needed to be assembled (not just the feet put on, but it arrived in 5 boxes!! Then Mike arrived to help assemble it. I say 'help' as though he didn't do the whole thing - which he did. I was assigned the cushions....you can imagine how much assembly was necessary. It was the Ikea equivalent of being told to roll bandages and boil water. by 1:30 the wallpapering was finished, Mike had assembled the sofa, we'd all sat on it and ate sandwiches. surrounded still by boxes and 'stuff' all over the place. 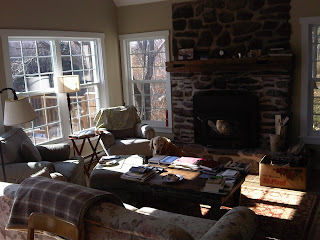 I spent the afternoon picking up things at random and wandering around the house, trying to figure out where to put it. To be honest, we got rid of a lot of 'stuff' when we packed up - and we're again 'editing' our belongings....paring them down. simplicity...though I think it's a little late for that. But we're doing our best. Now - Sunday - it is quiet, finally. The day Michael and I have dreamed of since last winter when we first started thinking about this renovation - spurred on by the need to replace a solarium that was falling down and wouldn't survive another winter. We found Bob Ray, and he found Maurice and his men, and Mike and the electrician and plumber and painters. Gary joined us - and over just three months two roofs were completely rebuilt and replaced, the glass solarium became a sunroom with fireplace - new floors - a bathroom was remodeled so that if one day one of us can't make the stairs we can turn the TV room into a bedroom....the door to the bathroom widened to accommodate a wheelchair. In case. This house is a home. Forever, we hope. We know how lucky we are. In our fiends. In Lise and Gary and Bob and Mike and so many others who've helped. In having this home - in having the ability to live here. A home we adore in a community we love. In having a certain stability in uncertain times. On the fridge, I placed a single small red dot....a magnet. It can be seen from almost anywhere in the 'new' space. If you get really, really close, you can see there are three small words written beneath the red glass. Walked back and forth to the house a few times today, taking Trudy. Mostly because I couldn't be bothered to clean off the car. We had our first significant snowfall - loads of warnings out. Not a day to be on the highways. It hasn't snowed a great deal - 10 to 15 cm- but very heavy, sticky. The sort of snow that's very difficult and dangerous to drive in. Besides, it takes a few snows before we really get out 'snow legs'. Garages packed with people trying to get their winter tires on. It's now illegal in Quebec not to have winter tires - which I think is a law long overdue....not just for the safety of the driver, but for the others on the road they might (and do) career into. But the deadline must have been chosen by someone who winters in Florida. December 15. Generally by Dec. 15th we've had a number of significant snowfalls - like today. So today I wrote the December newsletter and got caught up on some correspondence that had been piling up. Bought a new blackberry. I sort of toyed with an iPhone 4 - but I mostly use the machines for email - and sometimes for talk. I really don't need the other things. What I need is a sturdy workhorse. I loved my current blackberry - but it has now worn out completely. Had it repaired once - but now I think it's beyond that. So when my wireless provider called today with some new package options I decided to go for the Blackberry Bold 9900. Hope it's OK. Mostly, I just want the keyboard to work - but in my experience no one seems to make great mobile keyboards, except my old clunker. But, we'll see. I'm quite looking forward to having a new machine, though i offered it to Michael since he seems much more plugged in to these things, and I can have his old model. So that's the sort of thing that happened around the office today. You can see the workspace, in our military-industrial complex. I think you can even see the snow through the windows. Happy trails, for those of you traveling for American Thanksgiving tomorrow. have a wonderful, fun time! I finally appreciate the full depth of that saying...Waiting until the dust settles. The floor guys came on friday and sanded...without a bag to collect the dust. Our construction manager Bob Ray, who was there, describes it as akin to a dust storm in the Sahara. He and one of his workers, Ashley, went in on Sunday and cleaned up. They had to vacuum the ceiling. The walls. Inside the kitchen drawers. The floor guys came back today....we were all shuddering....wondering what next. I went to the house at 7am to let them in. They arrived at 8. And announced they had more sanding to do. Now, I hadn't witnessed the ordeal on Friday, but Bob was almost in tears describing it. So I asked if it would be as bad. I stared at them, nodded, and left. The better part of valour? Just chicken, really. I realized if they were lying or telling the truth, it didn't really matter - whatever was about to happen, would happen....and I had to just step out of the way, and let them get on with it. We went back at 5pm...and rushed in before our courage failed. To find...the place almost pristine! Or, at least, not any filthier than it was at 8am. And the floors??? 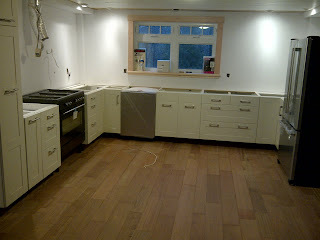 Well, they'd managed to get the first coat of oil on the reclaimed teak, and the floors are spectacular. My God - even better than I dreamed. Lise and Donna and Lise's friend Rose are going in tomorrow, while the floor guys put on a second coat....to do a clean of the upstairs. It isn't too bad - but it sure is far from clean, after three months accumulating construction dust. I suggest to Lise they get those masks, so she's off to Rona to buy some first thing. What a travail, these renovations. But we've had worse. We actually had our home - many years ago - burn down. All the way to a smoldering black hole in the ground during renovations. Apparently one of the roofers tossed a lit cigarette into a garbage can filled with saw dust. And the inevitable happened. Measured against that disaster, anything else looks like a cake-walk. 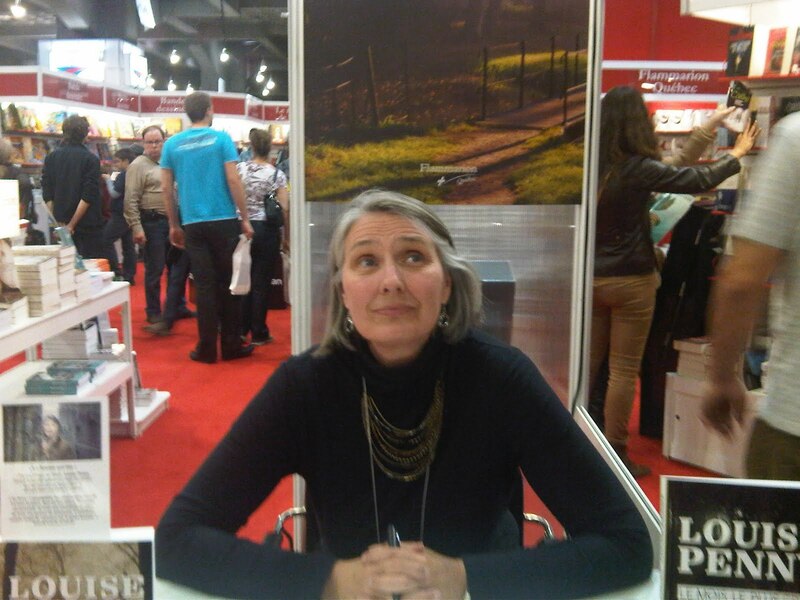 Yesterday, as I mentioned, I did another signing session at the Salon du Livres, at the booth of my Quebec publisher, Flammarion Quebec. Lots of people - but there were some quiet moments. I was telling you how horrifying those can be....one of the Flammarion employees captured a few of those moments on film. Yes - that is what creativity looks like. I am indistinguishable from Jane Austen. Hope you enjoyed your weekend - speak soon. partly cloudy - chilly day - but getting milder....rain on the way. We're heading back to the country this afternoon....can hardly wait. We'll be staying in the cottage for another week, while the floors are being sanded and oiled. It's made of reclaimed teak and I'l so impatient to see how the oiling comes up. The sanding man, who is apparently terrific, forgot the bag for his sander and instead of taking the time to go back to his shop to get it, he sanded all Friday without it. We were in Montreal and didn't see the mess...thank heaven....but I can imagine. Actually, I'm trying not to imagine. Bob, who is running the renovations, said he sealed everything....and he is terrific. So maybe it isn't as bad as I imagine. I'm sort of seeing a brownish desert - drifts of wood dust. Settling on the counters, shot into every crack and drawer. Stuck to the walls. In our bed. A sort of Three Bears of construction. We're heading home tonight, as I say....we'll take a few deep breaths, then go in and see. The beauty of imagining the worst is the huge relief when it doesn't happen. I'll let you know. The Salon du Livres in Montreal was terrific yesterday. As you can see by the photo...packed with people - loads of families and children almost hysterical at meeting authors of their favorite books. Quebec is a highly literate society....love books, of all sorts. 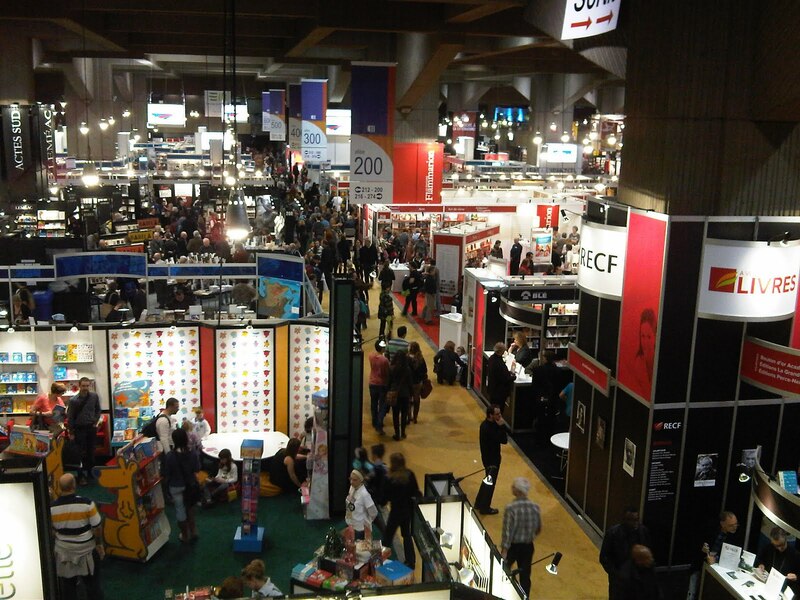 There's nothing like the Salon du Livres in English Canada. It's a huge book fair. There was, a few years ago, a Book Expo in Toronto - but that was for industry insiders, and not open to the public. I'd love to see a book fair in the english world. There are book festivals, but it isn't the same thing. At the Salon - it's open for almost a week and basically the publishers put up booths and their authors sit at desks and sign books. It's a lot less structured and formal than a literary festival. All sorts of panels happening, and on stage interviews....but it feels like this huge, joyous celebration of reading. Wonderful. Invigorating. My event was between 3 and 4 yesterday. Met lots of people. fun to see the lines growing, from last year. I'll tell you, sitting at a desk for two hours (as I did last year) when no one shows up is exhausting...far more tiring that speaking with, and signing for, hundreds of people. It really is very difficult - sitting alone and making it look like I don't care. So it's nice when it feels like that time is past here in Quebec. 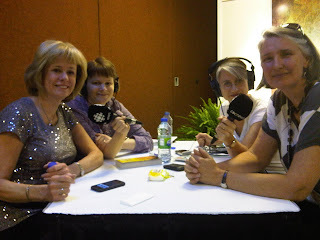 Had fun doing the interview with Kathy Reichs. 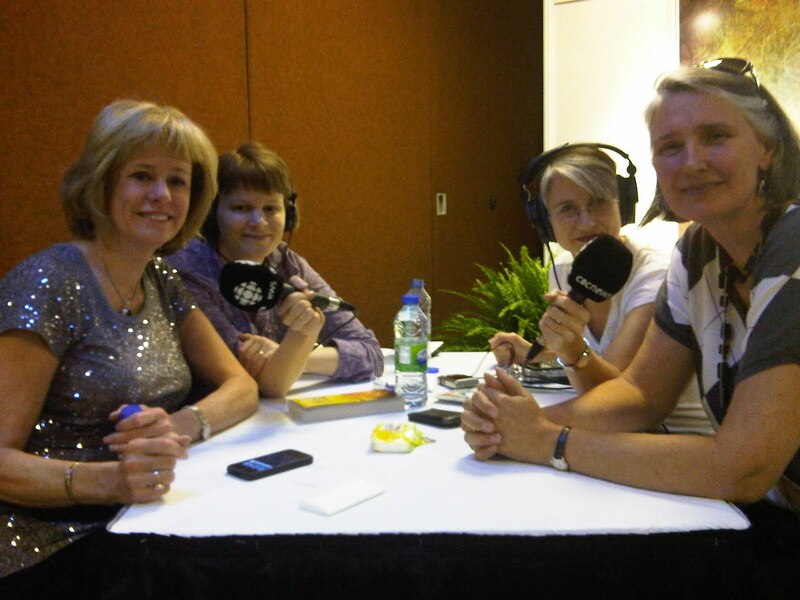 You can see the photo of us - with Elizabeth holding the microphone to Kathy and Alison holding the microphone to me. Alison is the producer of the CBC national radio programme C'est la Vie. They recorded a conversation between kathy and me on Saturday afternoon at the Salon. I'm just amazed her her stamina - all the calls on her time, and she's still standing and smiling. Such fun to talk with her. I'll be at the Salon again this afternoon from 3 to 4, then Michael is coming to pick me up and we'll head back to the country. Our reclaimed teak Sahara. One of those classic, cold, gray, late fall day...the sky threatening, and then delivering. A mix of rain and snow. Michael and I were out in it - against all odds I got off the bed today. Returned the DVDs - then went for Indian food (which sadly wasn't all that great) then headed to a hardware store...and got caught in the sleet. We stopped and bought a Christmas gift that needs to be mailed out...dear Lord, how quickly Christmas arrives! And a box of Christmas crackers. They're just about my favorite part of Christmas...popping the crackers, wearing the silly hats, reading the stupid jokes and trying to get the cheap plastic gift to 'work'. Can't imagine why those crackers just give me such pleasure, but I know Christmas wouldn't feel the same. I think it's just impossible to take anyone, or myself, too seriously with those hats. Just relaxes everyone. Like wine, with a small explosive. After that we headed home to the apartment. The really fun news is that the great folks at Aunt Agatha's bookstore in Ann Arbor (run by Robin and Jamie and very influential in the mystery writers/readers community) has chosen A TRICK OF THE LIGHT as one of their Best Crime Novels of 2011. You can get their full list if you go to Aunt Agatha's website. it makes a wonderful reading list, and Robin provides very thought reviews of each book, so you get a flavour before committing to the book. I'm just so thrilled about this...a genuine honour...especially given the other books and writers listed, as you'll see. And - closer to home - Amazon.ca has named A TRICK OF THE LIGHT one of the top mysteries of 2011 - and among the best 20 books (fiction and non-fiction) published all year. I am so thrilled I can't tell you. Though I think you can guess. On top of that, my UK editor, Dan Mallory of Little, Brown wrote to say he also thinks the next book, THE BEAUTIFUL MYSTERY, is by far the best of the Gamache novels. Phew - and yippee....and all sorts of joyous swear words I won't impose on you here. It was a beautiful letter, detailed and funny, and very moving. I printed it out and won't tell you how many times I've re-read it - and how many times I plan to continue to read it. My new hobby. Thank you, too, for continuing to support A TRICK OF THE LIGHT. Hope it finds its way under some Christmas trees...love to think of it wrapped and waiting. Off to do some errands tomorrow - accountant and Michael's eye doctor for a visual field. Then I'll be signing at the Salon du Livres (the book fair) in Montreal on Saturday and Sunday, from 3 to 4. On top of that, the CBC Radio show C'est La Vie - which is on the english network but talks about issues to do with french Canada - has arranged for Kathy Reichs and me to have a conversation. I'm not at all sure what we'll talk about, but I can guess. 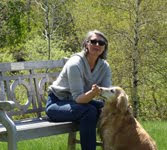 I've met Kathy a few times and have been so deeply impressed by her smarts and how friendly she is. No sense that she's 'here' and the rest of us are 'there'. So, I'm looking forward to it. We're in Montreal - stopped by Nespresso to get a new machine...tired of fighting with the old one - though it owed us nothing. We'd used it many times a day, everyday, for years. And it still works - sort of. Trying to decide what to do with it. Give it to someone handy, I think. The fun news is that I heard from the publisher himself yesterday. He called twice...once I was out doing errands and he (Andy) spoke to Michael....and the second time I was in. He called to say he'd just read THE BEAUTIFUL MYSTERY, the eighth Gamache novel - and loved it. Indeed, he said he was trembling at the end and actually stayed home Monday morning to finish the book. Then had to call to tell me it was his favorite. It was one of those calls an author (or at least this author) dreams of getting. Not only because it says something about the book - but it speaks so beautifully of Minotaur Books, my US publisher....that the head of the imprint himself would call. I've heard, of course, from my wonderful editor- and we worked on the editorial notes together....but to actually hear from the publisher is amazing. Incredibly passionate about books, and publishing - and so supportive. Wow. I'm so excited to get THE BEAUTIFUL MYSTERY into your hands. We don't have a set publishing date yet, but it will probably be sometime next fall. Someone asked a very good question on my Facebook page today about why it won't be out for 10 months when the book seems finished. One of the great discoveries for me about the publishing industry is how very many decisions need to be made - and all the care that goes in to getting a book out. For instance, while the editorial decisions have been made - those to do with content and continuity and character and those sorts of things....the book still needs to be given to someone who specializes in doing the 'line edits'....that's for the most part spelling and grammar and some issues of continuity we haven't yet caught...if someones eyes are blue in one scene and brown in another...or if Gamache and Beauvoir are on their third lunch of the day. For those of you with an eye for this sort of thing, you'll know that even with all this scrutiny and very hard work, mistakes still sneak through. She'll finish those notes in January and send them to me....I'll then go over the manuscript again. This actually happens a couple of times before we're happy and feel it's ready for you. I write five or six drafts of the book, until I'm pleased with it. Then I send it to my agent in London (Teresa Chris) - if she's happy, she'll send it to my UK editor (Dan Mallory at Little, Brown) and my US editor (Hope Dellon at Minotaur Books). They read it and get back with their notes....which are pretty much wanting to make sure the characters are consistent with their personalities, time-lines make sense - the structure and pacing and flow are good....there are no plot holes. They act as sophisticated, knowledgeable, rational 'readers'....since by then it's often very difficult for me to be able to stand far enough back to appreciate things like structure and pacing. They'll give me their suggestions (and they are just suggestions....they never insist and never, ever make the changes themselves, but leave it up to me). I read their notes and think about them for a while - then do another draft - making the changes I think are appropriate. We can sometimes go back and forth a few times, fine-tuning as we go. It's an amazing, quite intimate, process. On the one hand it's highly solitary. I conceive of the story, the tone, the plot and character development. Then they come on board...and as the process progresses it becomes a team effort. Not a committee - but a team. Each member has their expertise. Editing, grammar, marketing, publicity, strategy, cover design. It's very satisfying and very powerful when everyone respects and appreciates the contribution of the other....and no one becomes a bully. We all have a place at the table, and have earned that place and earned the right to be heard. I have a lot invested in it - emotionally, creatively - with my time and efforts. But so do the publishers - with their time and effort - and money. It all needs to be respected and valued. Once the editing is done then the Advance Readers Copies - or ARCs - are printed. These are mostly for bookstore owners, libraries, critics...opinion makers. People who will read the book and pass judgement. It's pretty nauseating, for a writer - for this writer. Ugh. I literally feel sick. I know it shouldn't matter - and when I wake up at 3am, anxious, I repeat that I've done my best...as long as I've done my best, that's all that I can ask of myself. The rest is up to others, and the Universe. That helps. A lot. Until the next night. I suppose if I didn't care so much, I wouldn't worry so much. If I didn't put so much into the books, and genuinely care about the characters and you, the reader....then I might be more cavalier. but I think the person capable of writing the books is also the person who is vulnerable. It's the full package. I get the joy when things go well, and the heartache when they don't. That's the adult reality...can't have one without accepting the other. 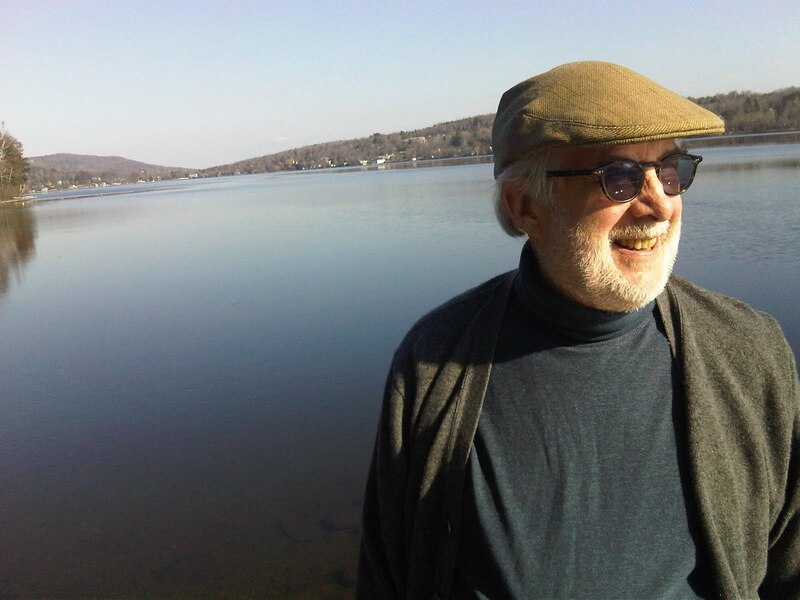 Which is why, when the publisher himself calls, raving about THE BEAUTIFUL MYSTERY, I subside into a chair, my legs weak but my heart strong and soaring. Phew. Then - decisions about cover design start. And strategies of which week is best to put it out...what other books might come out then - when is it best to tour? Where should I go? I'll be going to NYC in early December to meet with the publisher and discuss these things. What a very long answer to a single question! I dare you to ask another! Thanks for sticking with me - presuming you're still reading. Hope you're enjoying this late autumn day. We're off to lunch at the Tavern on the Square. Actually, while I say cool, it is seasonable, and has been well above seasonable for a few weeks. We're back from our retreat to Hovey. Our friends Bal and Linda have arrived and are staying at the cottage, and we decamped - and set up new camp - in our real home!!! Fianlly. It, and we, are covered in construction dust. yes, not great perhaps for the physical health but I can't tell you what marvelous things it's doing for our emotional health. And what an amazing job the guys have done. Honestly, there's nothing I regret....nothing I look at, tilt my head, and wish we'd made another decision. But like so many other great things in our lives, this was a team effort. Kirk and Jane helped with the decorating and design issues. Bob (our construction manager) is brilliant with his suggestions (often made a few times with increasing insistence, until we finally click in that it's not a polite suggestion, and we finally say yes). 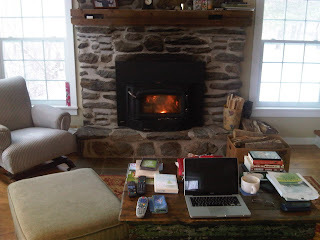 The fireplace was designed by Bob - agreed to by us....and executed by two amazing local guys...Mike, the son of a stone mason, and Ashley, a young guy originally brought onboard to just clean up but who discovered a deep love of and aptitude for working with stone. Lovely to see his enthusiasm - and the kindness Mike showed in mentoring him. 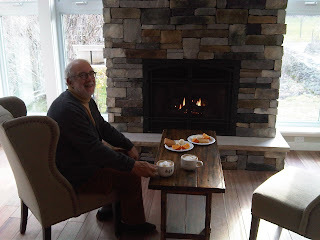 The photo is our very first breakfast in front of that fireplace. We look at it and don't see just the stone, but those two young men, working hard to get it just right. In fact, we look all over this place and see the men who worked so hard. For money, yes, absolutely. It's a job. But we've, in the past, paid a great deal of money and had work done badly. Half-assed. By people who didn't really care. We can tell the difference. Our home is more than just walls and a roof to us. It harbours us. embraces us. And those who build it become special to us. Not that we'll have long term relationships with them - we won't. At least, not with most of them. But we will always see them here...building our safe harbour. It's still a few weeks away from being finished. Later today Michael and I will carry the chairs and table and other things back to the dust imbedded living room...and cover them. And prepare the place for the workers like our good friend Gary, and Daniel the painter, and Mike and Bob and Ashley, to return tomorrow. While we move out again and back to the cottage. We're inching forward - and trying not to make too many, 'oh we don't care anymore' mistakes. Or the tempting, 'We're tired of paying, let's just go cheap' mistake. A steady hand on the tiller - and we'll be home again before we know it. Hope you've had a wonderful weekend....talk soon! Much cooler today....but yesterday at Hovey in North Hatley, Quebec, was another stunner of a late fall day. We never, ever expect it - and when sunny and warm temps happen in November, we all just walk around smiling. Here are some pictures Michael and I took down by the lake. It started off - until early afternoon - absolutely still. 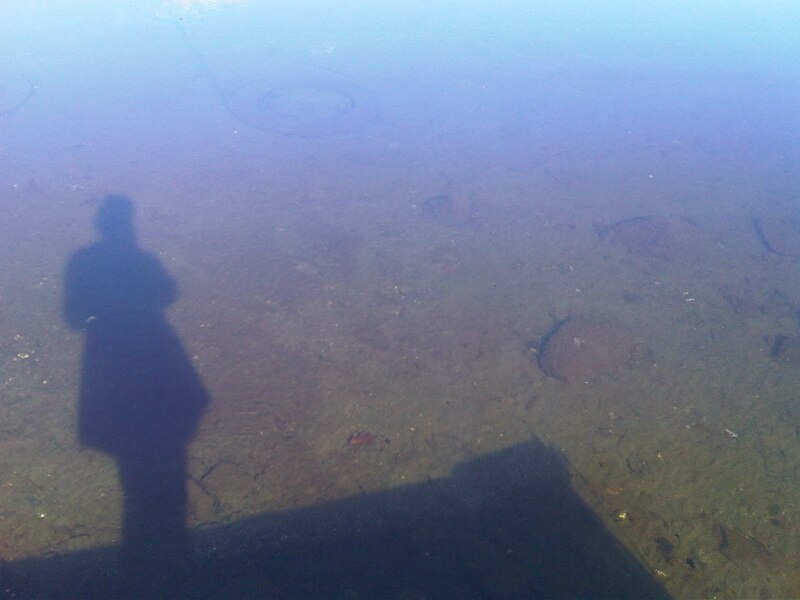 You can see how clear the lake it. Lovely final day - picked up the car from the dealership....read in the library. Went for walks. we had scallops as an appetizer and then Michael had the halibut (I'd had that the night before) and I had filet mignon. They also do what's called in Quebec an 'amuse bouche'....which is a small sampling of something the chef whips up....a little something extra. Last night it was an oyster on the half shell, cooked with bacon and cream and melted blue cheese. Yes - I'm not making that up. And it was as yummy as it sounds, apparently. I like oysters, but Michael's the big fan - so I gave mine to him. And the smile said it was a wonderful few bites. Drove home this morning, into gathering clouds and finally light rain. I stopped in Knowlton to have my hair done by Tammy - and Michael came home. 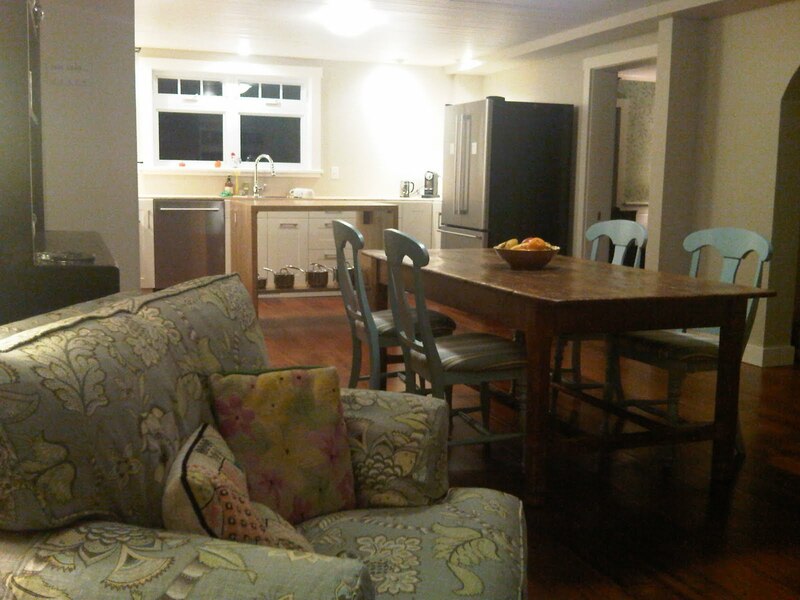 We'll be moving back to the house tomorrow night, so that our friends Bal and Linda can use the cottage. But the main house isn't quite as far along as everyone (read: Michael and me) had hoped. Always small glitches, I know. But still - we're almost there. Not much cooking, I think, will be happening in the kitchen - but to be fair, not much ever really happened. So it'll be a bit like camping....but such fun to see Bal and Linda and hang out for a few days. 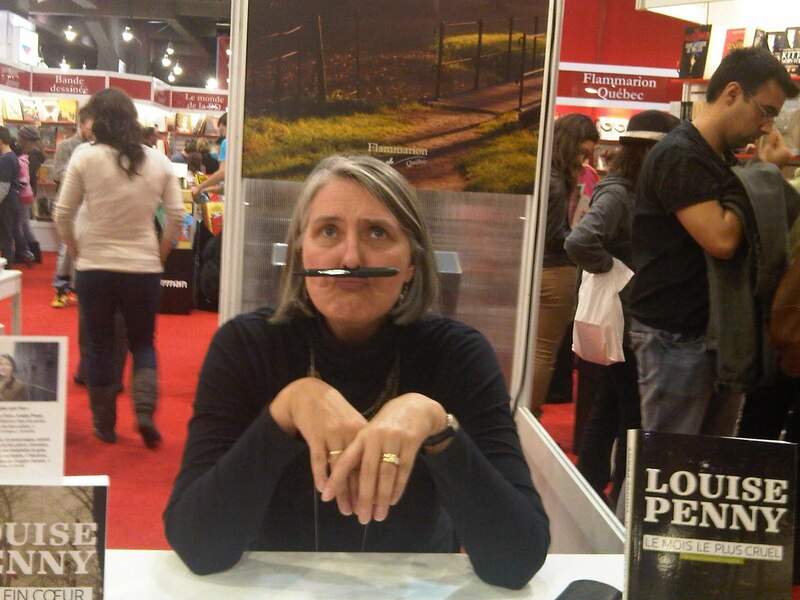 Then we're in to Montreal for some appointments then the Salon du Livres in Montreal next weekend. tomorrow is Remembrance Day. And quite a numeral....111111 We've bought out fourth (or is it fifth) poppy for our lapels. they keep springing off. I'm beginning to think what we take for fall leaves are in fact poppies on the ground. I am always so moved by Remembrance Day - and I know most of you probably are too. Hard not to be. Especially these days, when so many young ones have died in current wars. We really do remember, you know. And give thanks. And are in awe of such courage - of the soldiers, but also of their families, to let them go. A stunningly beautiful stretch of days here in Quebec. Way milder than usual. Michael and I are at Hovey, and we spent the morning, after breakfast, sitting on the wide verandah with a coffee and the newspaper. 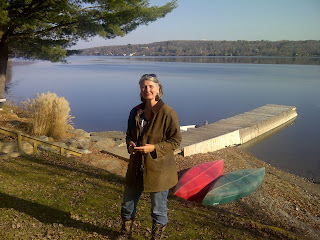 Bundled up, but sitting in the sun and loving the fresh air and peace and quiet. 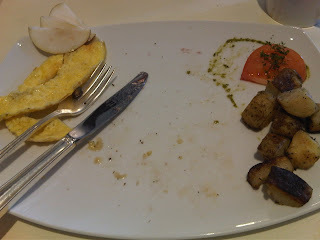 This morning for breakfast we had an omelet with melted brie, sauteed mushrooms, stewed apples and honey. With bacon and sausages on the side. I took a photo of it...oooops. Jeez, in the short time it took to describe it, it's gone! Michael?! Speaking of Michael - there's a photo of him and Francine, at breakfast. 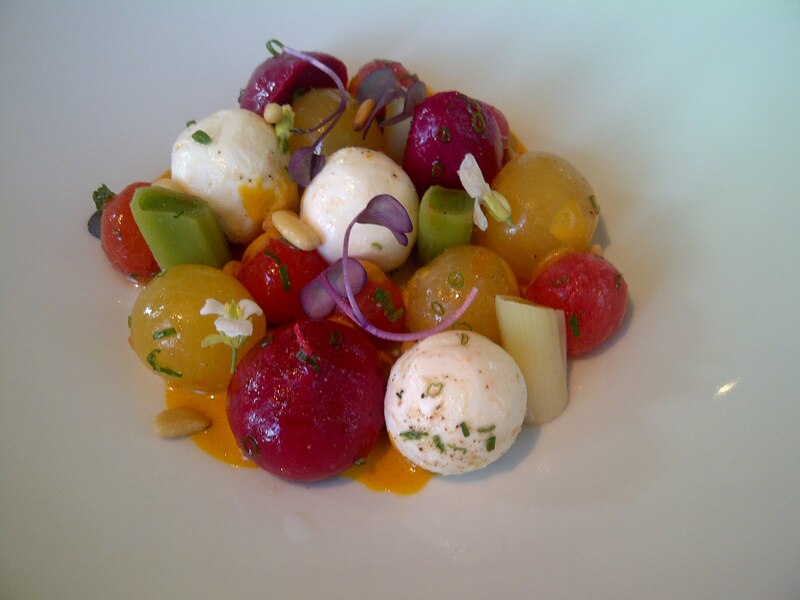 the other shot is the salad I had for lunch yesterday. We took my beetle in to the dealership to get the winter tires on (though when it's this mild it's hard to believe winter will truly arrive - how soon we forget just a week or so ago!) then headed to Hovey yesterday morning in time for breakfast...then met Danie Beliveau of Tourisme Estrie (eastern townships) for lunch. She had a proposal she wanted to make. She'd like to create a special Three Pines tour of the townships, based on places that have inspired the books. Very fun to think about...though as I said to Danie, the problem is that so much of the books really is fictional...my ideal. But quite a few places have been mentioned, and have inspired the feelings of the books. So we're considering it. The tour would be self-directing....letting people download it in English or French from the tourism site, and provide a map and some suggestions. This has been a wonderful day or so at Hovey Manor...not just intrinsically beautiful - but we received some fabulous news! Yesterday, A TRICK OF THE LIGHT was named one of the Top Ten Crime Fiction books of the year by Publishers Weekly. Today, A TRICK OF THE LIGHT was named one of the Ten Best Mystery/Thrillers of the Year by Amazon.com. And, yesterday afternoon, I finished the final editor notes on THE BEAUTIFUL MYSTERY - and sent it off to my New York and London editors. Phew!! How lovely to do it at Hovey. So much to celebrate. Wow. And finishing the editor's notes brought it home to me yet again (though I have to say, I'm keenly away of this all the time) that this is a team effort. The writing, the editing, the cover design, the publicity, the tour, and the readers. you're the ones who bring the characters and the books to life. We share these honours. 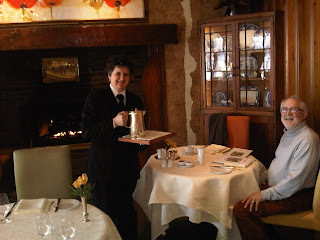 Well, back to doing not much of anything here at the Manoir. Hope you're enjoying your day. I think it's slightly milder than normal....such an unsettled time of year. We often go away in November....last year we went to London for ten days, to meet with my agent and editor. And just be in London! Now, London in November isn't exactly the Bahamas - but better than here! And besides, London anytime is wonderful, in my mind. But this year we're too tired, and too broke, to budge far. We're thrilled with the renovations, but I hate being in debt. Michael has a much bigger tolerance for it than I. So - it doesn't happen if we can't pay for it. Therefore - no big trips right now. But, honestly, this isn't exactly some big sacrifice! All I want is to be home. Curled on the sofa. Besides, so many decision to be made for the renovations....getting down to the details. Thrilling!!! but not the time to head off for long. But.... we have decided to treat ourselves to a celebratory visit to Hovey Manor this coming week. Three nights. Just us. Eating and sleeping and reading...and eating. I hope not to get out of my slippers. We'll get up at 6 tomorrow - head out by 7am....take the beetle to VW in Sherbrooke and drop it off to be winterized (tires mostly) - then get to Hovey Manor in time for breakfast. Meeting Danie Beliveau, of tourism for the townships, for lunch there. She has a proposal. So happy to have sent off the latest draft of THE BEAUTIFUL MYSTERY to the editors. This gives us a few days grace. And we plan to use it. In slippers. So, if you're at the Manoir this week and hear two people shuffling along, it's just us. And, to add to the delight, we put the clocks back last night and so have been given - like most of you - an extra hour. Hope you have a terrific week. We bought our poppies yesterday after breakfast with Joan. Deeply moving to see the war vets, wearing their medals. Be well - talk soon. A raw day. Sitting in front of the fireplace here at the cottage - you can see the photo. Rustic, comfortable. There's Trudy eyeing Michael's snack. I think we're going to miss this place when the main house is finished. It's looksing amazing, by the way. Stonework by Mike and Ashley is a work of art. And Gary got all the tiles this morning....went at 8am to pick it up, only to discover the place doesn't open until 9am....so when I called he'd just sat down with a blueberry danish and a double double. To wait. Not bad. Michael, Kirk and I went off to Ikea this morning - had to return a bathroom cabinet that's too big. Wow - are those flat packed Ikea cabinet things heavy! We lugged it out of the car and to the returns desk where Michael waited about an hour while Kirk and I scouted sofas....then returned to Michael just in time to return the cabinet. Ikea for all their great design reeeeaaallly needs more staff. Though, have to say, the staff we dealt with either at the returns desk, the delivery desk, or the clerk in the 'living room' area were all magnificent. But way overworked. And absent. Very hard to find a clerk actually on the floor. but we got everything done and collapsed in the cafeteria for an Ikea lunch. If you've never had an Ikea lunch you're missing something. the line moves fast and the food is surprisingly yummy. Kirk has swedish meatballs and vegetables and a sort of brownie pie. Michael had roast chicken and I had fish and chips. Perhaps because we were all exhausted, but the food sure hit the spot. Then hopped in the car with the five million pillows kirk bought and the waste paper buckets Michael purchased. And headed home...through the snow squalls. It really was impressive to see the storm in the distance...like a massive gray wall had been erected across the highway. We couldn't actually tell what it was...rain or snow or ice. I have to admit, I was happy not to be alone in the car. Then we hit it. Sleet. Pounding off the car and the pavement - but only for about two minutes - then we were out the other side and into bright sunshine. Arrived back to find that the chimney inside the main house has almost been finished and looks great. The trim has almost all been painted....and Gary has just about finished the tile backsplash behind the stove. Very exciting. And - I sent off the edits for Book 8...aka - THE BEAUTIFUL MYSTERY. Having breakfast in Sutton with Joan tomorrow. Chairing a meeting tomorrow night....and have Sunday all to ourselves. Ahhhh. Hope you have the weekend you wanted. Be well, and I'll talk to you on sunday, I hope. really, a remarkable fall day - just beautiful. Long days - packed. Up at 6am - at the house (under construction) by 7:45. Cheryl came by with Gary to look. Love her reaction....such a great friend. We were at the house at 7:30 last night with the ebenist - Cameron and the architectural draftsman, Brian. Wonderful young guys with a new company....but they needed to see the new kichen and how the island they're designing wil fit. 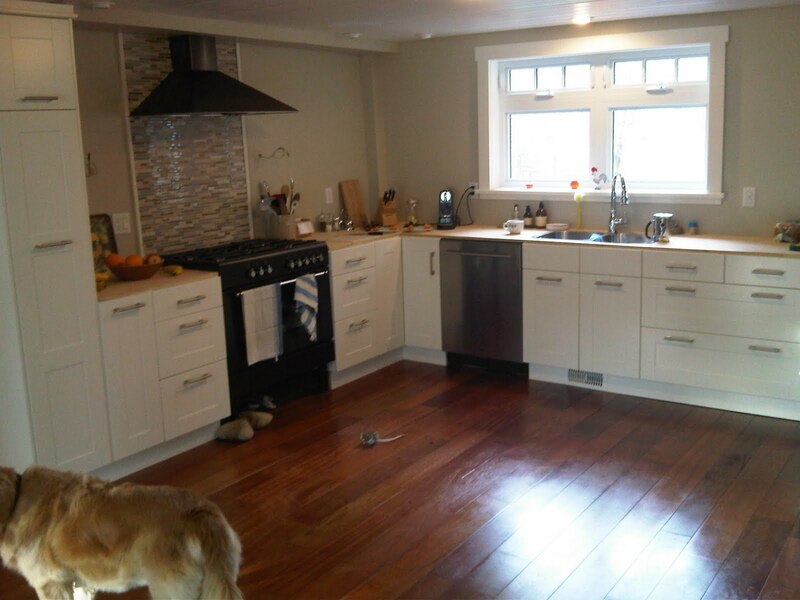 Ypu can see this photo of the kitchen...Ikea. In - but not quite finished (I hope...)- but close enough that I can taste it. or perhaps that's sawdust. The marble template guys are coming tomorrow. We ran into a problem today with the chimney stone. Wrong colours. Take a week or more to get what we hope will be the right stone. And the hearth stone didn't fit. And the vent against one wall sticks out too far, which means the piece of furniture that wall was specifically designed to have, will stick into the room. And the light switch for the kitchen is behind the fridge. Which also seems a problem. We all, like a band attached at the hip, move around the kitchen/dining area together...Bob, Michael, Mike, Gary and me. Going from one problem to the next. Staring at it. Heads tilted first one way, then the other. Trying to find the solution. I'll tell you, if staring could solve problem I'd be the most successful human in history. so we'd stare for a while, then move by mutual consent to the next. But I know a solution will present itself. They always have. Or not. But I also know these are not real problems. They're inconveniences at best. The great thing about today is that the gas people came again - and successfully hooked up the gas stove....and fixed the fireplace. I was far from convinced today would end so well. But it did. A huge relief. the november newsletter went out today - always a very fun day. 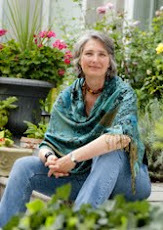 Linda Lyall, in Scotland, works very hard on the design and editing after I send her the text and some photos. Indeed, Linda also designs my website. Just interrupted by a phone call and didn't get back to the blog for a few hours. My goal is to get the edits of Book 8 - The Beautiful Mystery - done by the end of the weekend, if not before. Just bits and pieces left to do at this stage. Thank heaven...but so important not to flag...so easy to stall close to the finish line. Just received some very fun news...A TRICK OF THE LIGHT has been nominated for the GoodReads Readers Choice Award for Best Mystery. I have to say, I'm very, very happy about this....the first time for this terrific nomination. Well, off to bed. Hope you had a terrific day.